Of course it goes without saying that even on vacation I’m gonna do a bit of thrifting. My oldest daughter enjoys it too, so we are good thrifting buddies. And what fun to have some “fresh” thrift stores to peruse! The first store we went to, Animal Welfare Benefit (“Keeping people and their pets together”,) had some nice vintage things (and super nice sales staff), but some wacky pricing. For example, all the children’s wood puzzles (most from the 1980s so NOT super old) were $10. Had to leave those behind. 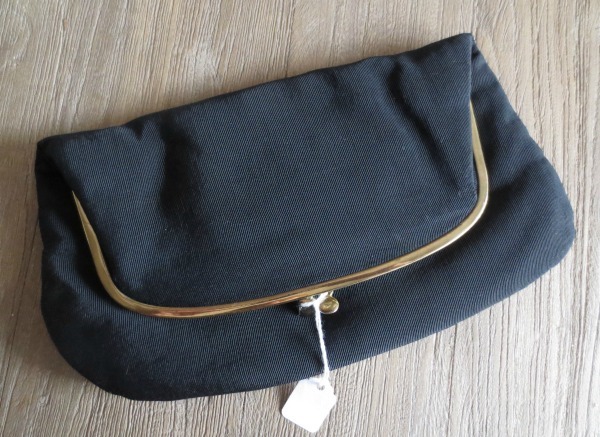 I did buy a pristine black 1950s Ingber rayon purse. It had originally been priced at $50! For the life of me I can’t figure out why they had it so high. But it had been marked down several times and was at a price point where I can make a little profit. 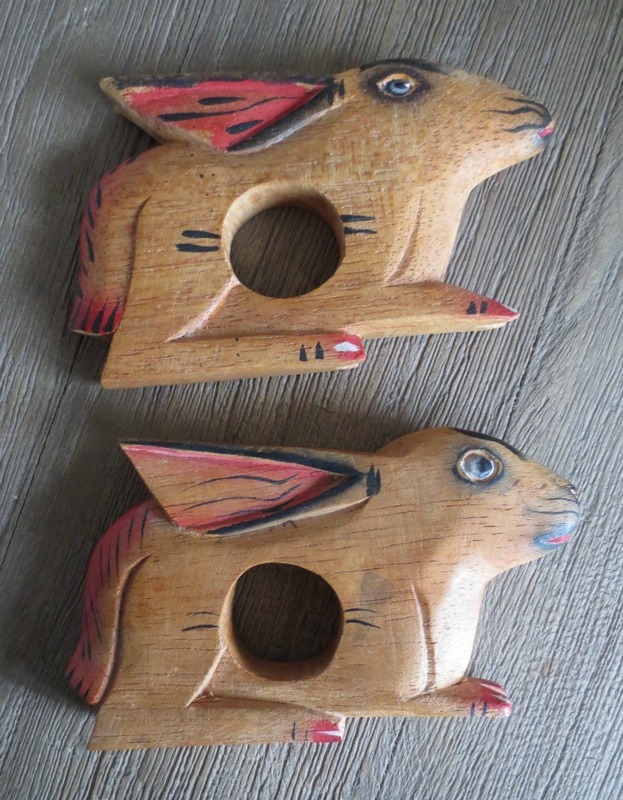 These handmade folk art wood rabbit napkin rings were irresistible and quite reasonable. 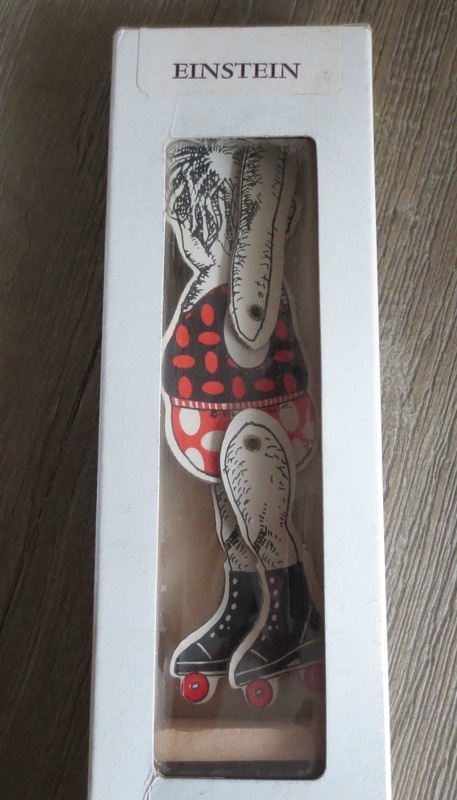 And I should do alright with this fabulous quirky 1980s “Einstein Acrobrats” toy, new in box. I’ve only found one for sale online from an eBay seller in Poland. 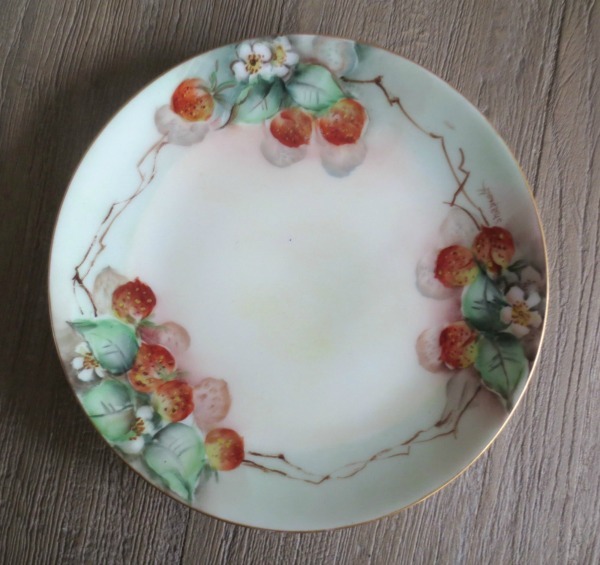 And I’m always drawn to sweet handpainted plates. This one is a Thomas Sevres, Bavaria and has the artist’s signature. Not a lot of profit selling this one plate on its own so I may wait till I find others and create a lot. 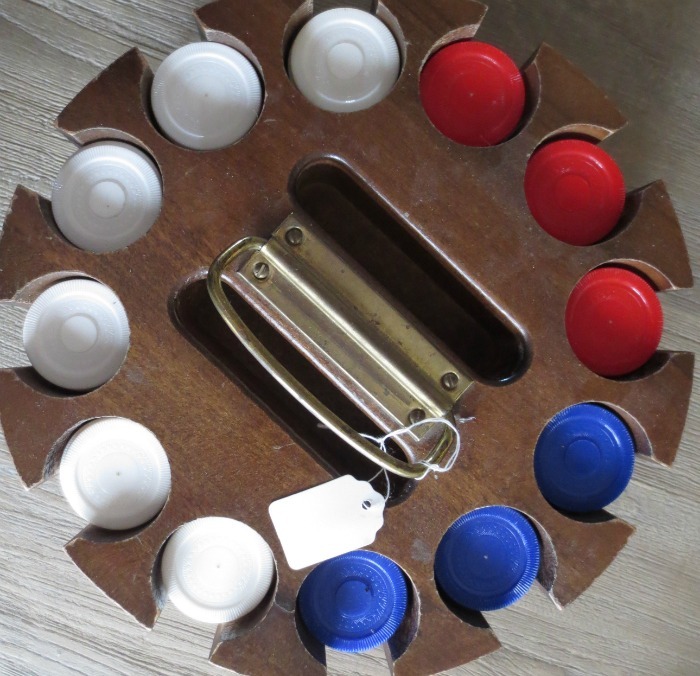 And as I was paying for the pot I saw this large wood poker chip carousel in the glass case. Oh yah…game night is on! Our next stop was AFRP (Animal Friends Rescue Project) Treasure Shop. A bigger shop, but the sales clerk was a curmudgeon. When we first walked in my daughter noticed a large, framed poster she liked. It had no price and when she enquired he told he it was $50. The glass was broken in one corner and she said she’d have to think about it. He replied, “Well don’t think too long, someone else is going to come and buy it who can make a decision.” That struck us both as rather rude. After making a full circuit around AFRP I decided on buying three little dishes and he said to me, “Is this all you’re buying?” (WHAT??!) 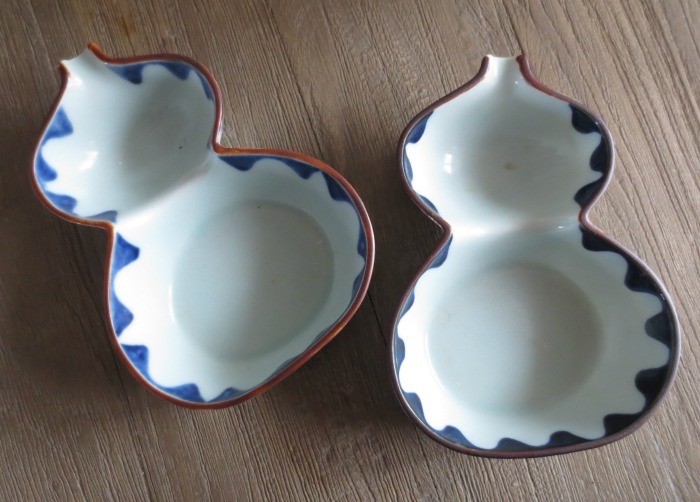 Anyway it turns out these little dishes were 50% off and only $1.50 each! In the end I decided to buy only two of them because I noticed a chip on one. The guy wasn’t happy that I wasn’t buying all three and said, “You can fix this with a little brown nail polish.” I said, “That’s okay. I’ll just take the two.” And he replied, “Then can you put the third one back where you found it.” Sheesh! After I paid for the dishes, he turned his back to me. No “thank you” or “have a nice day” or “come again.” And I had to ask for a bit of tissue paper to wrap around them. Rather off putting to say the least! I have no idea what these 6″ tall ceramic gourd-shaped dishes are used for or even what country they hail from. (No markings on the bottom.) But I found them interesting and attractive. They were intermingled on shelves with Asian pottery. Ideas? Our last stop was Spirals Consignment & Benefit shop that supports the “Alliance on Aging.” Really nice shop with beautiful items, but couldn’t find anything I could make money on. A good place if you’re buying for yourself though. Well, was hoping to spend some time at the ocean today though the weather is dreary, overcast and chilly. Not ideal beach weather. Hmmm…maybe more thrifting will be in order! Love all of this! I thrifted some glass cobalt blue leaf dishes for my mom.